So what exactly is steam? Sorry I am a little behind online... What is the difference between the steam game and the itch.io game? wolfadore wrote: So what exactly is steam? Sorry I am a little behind online... What is the difference between the steam game and the itch.io game? They have no differences when it comes to gameplay, so the game is pretty much the same. Thank you! I was worried that I was missing out on something! It's a popular online store (known for its sales: during the summet and winter sales games go for 50-75% off so a lot get priced at $5). It is also a program to manage the Steam games you have, and a community hub. Sometimes when you buy a new PC game now, like Skyrim, a Steam code comes in the box and you need to register it through Steam before you can play; this is to help prevent piracy. Any games in your Steam library have their save data stored in the cloud, and I believe it automatically checks them for updates. It also tracks time played and you can earn achievements for many games. As far as community, it allows you to add friends and join groups and allows you to chat while in-game, and you can also participate in discussion boards and share screenshots. So, many people prefer having a Steam version of the game in order to keep most of their games in one game library, make it easier to take screenshots, and have those extra community features as well. Can't seem to locate the Steam key? 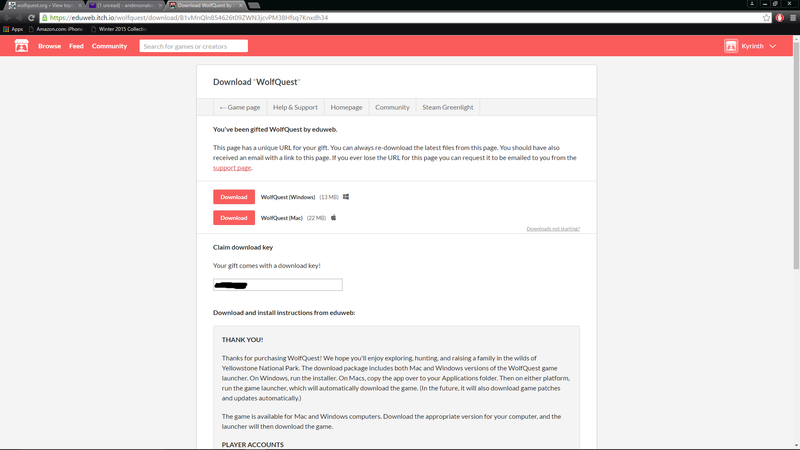 I went to the itch.io game download page, as Dave had said to do so, but all I see are the WQ downloads, and the download key used to create a player account. Could it be because the game was gifted to me? In-between your download buttons and the claim download key there should be a button saying Get Steam key, is that not appearing for you? Hmmm... very odd. All I can recommend is emailing the team on info@wolfquest.org, and they should be able to help. wolf567 wrote: Hmmm... very odd. All I can recommend is emailing the team on info@wolfquest.org, and they should be able to help. Alright, I'll go ahead and do that. I appreciate your help! im glad its up on steam too but i can't buy it so i might enter the contest neamara was talking about! i really want to play 2.7 with freinds but i don't have it yet. my moms in woodstock so i will have to ask her when she gets back in 5 days. if she says no i will be crushed because it is my faverite game in the world! i give it a 100000 star rating if it would go up that high! 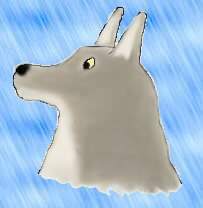 but im sad i can't get wolfquest 2.7 at the moment 2.5's multiplayer isent working for me. im really sad. It's great that WQ is finally on Steam! Many YouTubers use Steam as a game source so if one of the popular gamers discovers WQ while on there, you might have them getting the game out there to millions of people. This was a a great business move no doubt about it! I'm actually very happy about the reviews of the game. It started off as "Positive," and then it bumped up to "Very Positive." That's great! Upon looking through the specific reviews of the game, I only saw a few reviews that didn't recommend the game. Three, four, or five, maybe. Celestial-Howl wrote: It's great that WQ is finally on Steam! Many YouTubers use Steam as a game source so if one of the popular gamers discovers WQ while on there, you might have them getting the game out there to millions of people. This was a a great business move no doubt about it! Agreed, putting WolfQuest on Steam opens it up to a much larger group of people. There are plenty of YouTubers that have over a million subscribers who play "random" games (PewDiePie, I'm looking at you). If they stumble upon the game and decide it's worth a shot, imagine how many people are going to get the demo and purchase the game afterwards! With this burst of sales, we've begun work on the next round of game improvements, which I expect to release in two (free) updates, hopefully in June and August. No specifics to announce yet, but some really great stuff I assure you. This is really pleasing to my ears. More amazing updates will be delightful. I'm so looking forward to it!